In recent months, ~2 GW of Australian coal-fired electricity generation has been closed temporarily or permanently (~2.5 GW in winter), comparable to the 2 GW that would have been closed by the abandoned policy of contracts-for closure. Some might conclude Australia is finally beginning its transition to a low- or zero-carbon economy, and we can sit back and watch the federal carbon price and Renewable Energy Target (RET) drive it. But even if decarbonization was occurring fast enough (which is nowhere near the case), now is not the time to sit back, because the established electricity companies see their traditional business model disappearing down the drain, and they are fighting back. For a basic explanation of how the Australian electricity market works, see here and here. Generators produce electricity and sell it in the wholesale National Electricity Market (NEM); currently the vast majority of Australia’s electricity is generated by fossil fuels, mostly coal. The electricity is physically distributed by (in some cases state-owned) networks through poles and wires. Retailers buy it and sell it to consumers. Australia’s most important electricity companies are the three “gentailers”, so-called because they both generate and retail electricity: AGL Energy, Origin Energy, and Energy Australia (formerly called TRUenergy). The recently closed coal generation includes each of the following power stations, partly or wholly: Munmorah (600 MW), Swanbank B (125 MW), Playford B (240 MW), Northern (520 MW, in winter), and Tarong (700 MW). Most recently, Energy Australia announced it is closing one of the four units at Yallourn (360 MW), though the closure may be temporary. The “Repower Port Augusta” campaign aims to replace Playford B and Northern with solar thermal plants. The emissions intensity of Australia’s electricity sector had already decreased before the Tarong and Yallourn announcements: emissions from electricity generation were 2.4 Mt lower (and emissions intensity 7.6% lower) in the third quarter of 2012 than in the same period of 2011. This contrasts with Treasury modeling of climate policy, in which electricity sector emissions were projected to increase 8% by 2020 (with Australia’s emissions target met by overseas offsets). Importantly, the closures are not due to the carbon price alone. At $23/tonne it is too low to have much effect, and in any case is cancelled out by $1 billion per year in compensation which has actually increased the profitability of coal-fired generators. Its main achievement so far may be raising awareness of electricity consumption. Instead, the main cause is that wholesale electricity prices have plunged to $30/MWh, the lowest price since 1999 and 40% below average (adjusted for inflation). Low wholesale prices are in turn attributable to an unprecedented combination of increasing renewable energy and falling demand. Why does renewable energy reduce wholesale electricity prices? In the electricity market, electricity generators are prioritized from lowest to highest operating costs (the “merit order”). Although renewable energy generators may have high upfront costs (which are reducing rapidly), their operating costs are very low because there are no fuel costs. Thus new wind generation has pushed brown coal off its perch at the top of the merit order. Renewable energy is taking off in South Australia in particular, which in the first quarter of 2012 got 34.5% of its power from renewables (31% wind, 3.5% solar PV), overtaking coal (26%) and approaching gas (39.5%). Six years ago, wind provided less than 1% of South Australia’s power. Their lights are still on and their wholesale electricity prices halved from the first quarter of 2011 to the first quarter of 2012. Reasons for the fall in demand are thought to include installation of solar PV and improvements in energy efficiency (helped by temporary factors like milder summers). In South Australia and Queensland, midday demand has fallen almost 10%, implying solar PV is playing a major role in those states. In NSW and Victoria, demand has fallen at all times of day, suggesting energy efficiency is a bigger factor there. Australia is leading the world in rooftop solar; almost 1 in 10 Australian households now have solar panels, meeting 1% of energy demand. AEMO projects that the percentage of energy demand provided by solar PV will triple to 3% in the next decade, and that seems pretty conservative when you consider installed capacity of solar PV in Australia is currently doubling every nine months. If solar PV continues to grow exponentially, midday demand could soon fall below midnight demand. In June, the Australian Energy Market Operator (AEMO) released its latest demand forecasts, which were a dramatic downward revision of previous estimates of the forecast it made 12 months earlier. Until recently AEMO relied on state government forecasts; the state governments benefit from high demand projections because it justifies building more poles and wires. AEMO’s new independent demand projection for 2012-13 is 9% below the previous forecast. It predicts demand will resume growing but will not return to 2009 levels until 2017, and 2021 demand will be 11% below the old forecast. It is a good thing that Australians are consuming less electricity, but retailers do not see it that way. Reduced demand effectively creates an oversupply in the market, bringing down wholesale electricity prices and eating into the profits of generators and retailers. Surprisingly, in South Australia demand reduction has been enough to reduce the revenue collected by generators between noon and 3pm by almost 90%. Total revenue across the NEM fell by 35%. This leads to an amplifying feedback: falling revenue will cause retail electricity prices to rise, which in turn will drive even more households to solar PV. AGL’s description of this as a “death spiral” has been uncritically cited by an Australian Financial Review editorial calling for policy to support baseload fossil fuel generation. AEMO says the combination of lower demand and increasing renewable generation means there will be no need for new baseload fossil fuel generation in the next decade. It also means there was never any danger of the lights going out, in contrast with the claims of coal-fired generators in 2008-2011 when clamoring for carbon price compensation and, after they secured it, for policy “certainty”. New generation will be dominated by wind farms built to meet the RET, though as the policy currently stands this investment is being delayed by a surplus of Renewable Energy Certificates and expected to take off from 2016. The RET mandates 3 GW of new renewables by 2020 (compared with an existing 2 GW). The lack of need for new generation means these new renewables will continue to displace existing generation. Putting all this together, the electricity sector is undergoing a technological revolution somewhat analogous to that which has occurred in the communications sector. Traditionally electricity has been produced by a combination of “baseload” coal-fired or gas-fired generators operating day and night, and “peaking” gas-fired generators that can be quickly turned on and off, with a centralized network carrying power from a small number of power stations to a large number of consumers. It used to be that rising electricity demand raised prices, maintaining retailer profits and causing new baseload and peaking generation to be built. Now renewable energy and energy efficiency technologies are changing the game: demand is falling, solar PV is competing with the grid, and renewables are eating into the profitability of fossil fuels. Renewable generation will be more distributed, occurring not only at large-scale power plants but at a range of scales down to household rooftops. Renewable energy technologies don’t fit into the boxes of “baseload” and “peaking”; instead the electricity market of the future is likely to be comprised of “flexible” and “inflexible” generation (though nobody can predict exactly how it will look). As climate policy and technology cost reductions continue to drive renewable energy deployment, fossil-fuelled generators will increasingly become backup for renewables, before hopefully being phased out entirely. It is unclear what the role of electricity retailers will be in the renewable energy economy; one might ask whether we need them at all. All this is exactly what humanity desperately needs to happen to address climate change – but to fossil fuel generators and retailers it is a nightmare. They see their existing business model collapsing, and are lobbying hard to protect it. Renewable energy is an infant industry which relies on government subsidies. Even rooftop solar PV, which will soon reach the point at which it can be deployed without subsidies, needs continued government support to get there. The gentailers’ profits are threatened all along the supply chain. The three companies are invested in both fossil fuel and renewable generation to varying degrees. I will come back to AGL in a moment. Energy Australia is particularly invested in brown coal. Origin has invested heavily in gas, banking on a transition from coal to gas rather than from fossil fuels to renewables, but it has become clear that gas prices are rising while renewable energy technology costs are falling. In submissions to the ongoing RET review, Origin, Energy Australia, and other fossil fuel electricity generators advocated the RET, now fixed at 20% of the 2020 demand projected in 2009, be reduced to 20% of the updated 2020 demand projection. Their argument ignores that overachieving would be a good thing. Modeling commissioned by Energy Australia shows such a move would cause renewable energy deployment in Australia to stop completely in 2016, with only gas-fired electricity generation built post-2016. One of the arguments they make is that the RET increases retail electricity prices and thus costs consumers. While it’s nice to know electricity retailers are so concerned about overcharging their customers, in reality climate policies account for only a small proportion of electricity prices. The major factor driving up retail electricity prices is overinvestment in poles and wires. Of the price rise projected for the next two years, more than 85% will be due to network and distribution costs, and less than 15% from climate policies. While the grid does need to be updated for a renewable energy economy, the current investment is only to supply peak demand. Even if you believe Energy Australia’s claim that the RET will cost $53 billion (based on modeling by a consultancy with connections to the fossil fuel industry, which does not adjust for inflation and fails to account for the RET’s effect on wholesale prices), it only sounds scary when calculated over 20 years, amounting to merely 13¢ per household per day. Alinta Energy, owner of Port Augusta’s brown-coal-fired power plants, revealed the generators’ true reason for concern in its RET review submission: “Existing non-renewables should not be stranded as a consequence of the Renewable Energy Target”. AGL, who chairs the Clean Energy Council (CEC), is superficially greener than the other gentailers, in that it is investing in a large amount of wind generation. However, AGL also recently bought Australia’s largest brown coal generator Loy Yang A and intends to run it for decades. And of course as a retailer their profits are threatened by rooftop solar PV. 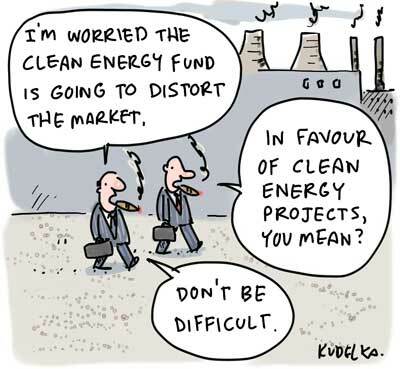 Although supportive of the RET, CEC and AGL argued against increasing the RET on the basis that any changes could undermine investor confidence. More importantly, AGL has led the campaign against feed-in tariffs, the mechanism which has delivered the majority of renewable energy globally. In March, the company praised state governments for slashing their feed-in tariffs and called for the then-newly-elected Queensland government to follow suit, which it did, unsurprisingly. AGL’s complaints about feed-in tariffs included that they accelerate the growth of the solar PV industry and transfer wealth from generators to consumers. AGL also called for the Clean Energy Finance Corporation (CEFC) to support R&D instead of deployment, though fortunately they were unsuccessful in that instance. The cries that renewable energy subsidies are unfair and “distort the market” are short on memory. Fossil-fuelled electricity generation is profitable today thanks to past subsidies from government. In fact, Victorian power stations were owned by the State Electricity Commission until the 1990s. Fossil fuels continue to benefit from $13 billion in federal subsidies (including carbon price compensation, as I’ve already mentioned). The electricity industry is not alone in its war on renewables; indeed many others are more hawkish. Business lobby groups like the Australian Industry Greenhouse Network and government advisory bodies like the Productivity Commission are campaigning for the abolition of all federal and state climate policies other than the carbon price (leaving it to the Liberal Party and Minerals Council of Australia to campaign for the abolition of the carbon price itself). They argue such policies are not “least-cost abatement” and are made redundant by the carbon price (arguments I debunked in my RET review submission). For example, the Productivity Commission’s latest report cites inaccurate estimates of the cost of emissions cuts from solar PV, estimates that have been debunked by the Productivity Commission itself in a report quietly released last December. At the Business Advisory Forum in April, the business lobby secured a Council of Australian Governments (COAG) review of non-carbon-price climate policies. This “COAG Taskforce on Regulatory and Competition Reform” is proceeding in secret, is not consulting the public, and is due to report within months. Increase the 2020 Renewable Energy Target. Withdraw the promised carbon price compensation for coal-fired generators. A broader thought: There is a tension between the public interest and the interests of electricity companies (at all points along the chain of supply). Maybe some of them should be nationalized?